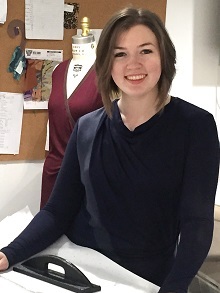 Trained in both art and fashion design and with a strong belief that striking clothing should also be soft, wearable and comfortable, I strive to create artistic designs that are elegant and timeless, that can be worn to the office as well as to an elegant evening event, and that are as comfortable as yoga wear. I use luxuriously soft fabrics that feel wonderful to the touch and have enough stretch to move with you as you go through your busy day. Many are made or dyed in the United States and sustainably produced. Many of my seam lines are similar to those used in swimsuits and exercise tops so my designs will move with you and never pull or bind. I also use drape to put give into my designs, allowing you to stretch and move in comfort. 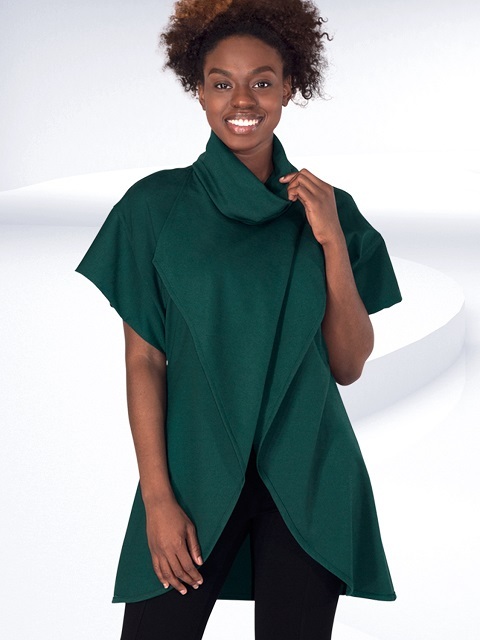 Draped fabric, which lends itself to striking clothing designs, looks great on the human body and the diagonal drape — which I use in many of my designs — is particularly flattering. Each of my garments is carefully cut and sewn one at a time in my Baltimore studio.